Street food is a way of life in Thailand, as it seems to be across Asia. We love our Asian cuisine, especially with a bit of a kick. Traditionally Thai food is often cooked outside, stopping houses getting even hotter and slowly but surely creating the food scene for which Bangkok is renowned. 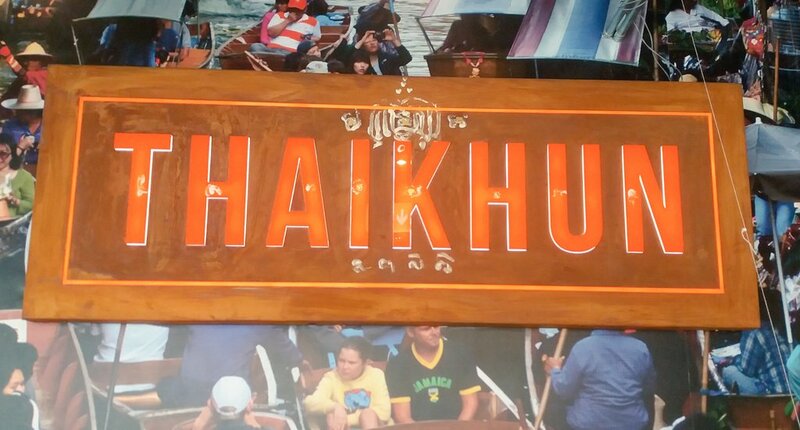 We love the opportunity to see what's on a new menu and when we were invited to Thaikhun for their latest offerings it was hard to refuse. We're keen to head out into South-east Asia at some point in the not so distant future so some food education before we go is necessary and where better than the street food inspired flavours of Thaikhun Nottingham. This was Jem's first visit to Thaikhun and being one of the best weather days of the year so far it made sense to head out onto the terrace area for some al fresco dining. There's certainly a character to Thaikhun's terrace area with oil cans made into tables and chairs alongside up cycled furniture all bright in colour. Whilst the views will never take your breathe away there's a feeling of calm despite being above a busy part of Nottingham. We love our quick eats and Thai starters come across more as snack foods that would make a great lunch if you chose a selection of 4-5 dishes in a similar way to Spanish Tapas. From previous we definitely recommend the Sukumvit 38 platter which remains on the menu as a house classic: featuring some of the best selling items from the Bangkok market by that name. With Fishcakes, Honey Pork, Steamed Vegetable Dumplings and Chicken Spring Rolls there's plenty to sample. If we could we'd have ordered everything from the starters menu and worked our way through it all slowly. Dumplings are a classic Thai street food so we decided to try some of the Ka Nom Jeeb. Steamed Dumplings with Pork and Prawn filling. The dumplings came out with a nice selection of salad alongside them, beautifully fresh and complimenting the dish. The Ka Nom Keeb were very nice, a lot lighter than they looked but filling at the same time. They came in a bowl with a soy based sauce that really worked well. We'd love to tell you what the sauce was flavoured with however we sadly couldn't quite grasp just what it was- very nice though! As we love a bit of piggy and so do the people of Thailand it seems we also opted for the Moo Dad Deow. Pork strips, marinated with palm sugar, pepper, coriander and soy sauce, before being fried and topped with sesame seeds. I loved the fried pork strips. The flavour was great with a subtle sweetness from the palm sugar and the slight sour from the soy making them a great snack that I'd happily devour repeatedly. A real highlight was the great chili sauce they came with which was almost like a jam. Well worth trying. If we could pick more off the menu we'd have likely opted for the interesting sounding Gai Satay. Chicken skewers with a peanut sauce although we also like the sauce of the Sweet Corn Cakes (Tod Man Khao Pod) flavoured with red curry paste and Kaffir Lime leaves. When we think Thai food we usually consider red and green curries as well as the earthy Massaman which are classics on any Thai menu. We've had them before but were really intrigued by the Gaeng Som, Deep fried Bream in a sour curry sauce. The young lady serving us wasn't sure if the curry came with rice (The menu stated curries served with jasmine rice when looking back) so we asked for a sticky rice which was needed for a cooling effect and to soak up the sauce. Featuring a deep fried whole Gilt Head Bream, butterfly cut to allow access to the flakes, swimming in a very warming curry sauce with lots of vegetables the Bream curry was very much a highlight of our visit to Thaikhun. For the squeamish the fish eyes were covered with the spicy sauce featuring carrot, green beans, courgette, pak choi and Chinese Greens to really fill out the dish. There was almost enough for it to serve two people which would be possible if you both had a portion of rice alongside. We also opted for the Moo Yang. A simple Thai street favourite featuring grilled Pork with a chilli and tamarind sauce. Nicely grilled this was a good simple choice which would suit any fussy eater. Whilst the pork was by no means lean, it was full of flavour. I love a bit of fat with my meat so it worked well for me. It was served with a choice of sticky rice or steamed noodles and I opted for sticky rice which came presented in a rather fetching container. We would also have liked to have tasted the Phao Kee Mao- spicy seafood noodles with prawn mussels and squid with a chili, ginger, oyster and soy sauce. We've also not had duck for a while so the Ped Phad Prik Pao sounded good with roasted duck slices fried with chilli paste mushrooms peppers and onions sounded right up Jemma's street. We didn't even have room for pudding! If you have children there's a great explorers meal option. 3 courses with a main course selection of Phad Thai, a mix and match Thai tray and Fried Chicken in a choice of sauces to give them plenty to choose from.